Yeah, but if you read 50 titles, that's over $100/month! To find every issue from over 50 titles a month in the dollar bins isn't realistic and would incur much more time and trouble than $100 in savings. I've got mixed feelings on a number of things especially over purchasing by retailers being a leading contributor to devaluing the investments even their own customers have made in books. A good example of this is how DC dumped qty variants on the market last year. People like me had no business getting our hands on them. They should never have been produced or at least destroyed. DC basically just said to all the people who invested in QTY variants from them that they don't care about their customers investments. By putting more copies on the market they watered down the selling price and increased the long term qtys available. I've got some 100 and 50 qty variants so deep I may never sell out at 25% of the potential value. Look at Return of Wolverine #1 coming next month. With over $12,000 (Qty = Price Math) in qty variants available for every 1,000 standard covers you buy, an extra 15% OFF the cover price for retailers to make that easier to do and extended billing for half the purchase price for an extra 30 days, #1 standard cover should hit the streets at a buck even though it's a $3.99 book. The 25/50 QTY's might start at COVER PRICE!!!!! Marvel's going to get a BIG Payday, investers have nothing to look forward to. I'm actually contemplating 50 CENT PREORDERS for the standard cover. If everyone waitied for the cheap bins there would be nothing in them. There would be no reason to order them in the first place if you're expecting to have to dump them. If I'm dumping them I'm devaluing my own customers investments who paid full price or subscribed and had discounts. In cases like Fantastic Four and Return of Wolverine where Marvel's heelbent on making sure the books are going to be overproduced, let's make them ignoratly cheap right away so everyone gets a stupid low price wether it's online, subscribed or walk-in. I don't believe in charging one price in one location and a different price somewhere else unless the locations additional costs are the difference like 5% higher listings on E-bay plus 29 cent for the upload listing fee. Or, alternately, you could speak with your wallet and not buy 1000 copies of a book to get a shiny variant. You might not get $700 for the 1:1000 variant (or whatever) but you're also not paying $3000 to get those 1000 copies. But you've just given Marvel reason to keep doing the same stupid stuff they do ... you've purchased 1000 copies of their book to get that 1:1000 cover. You've proven them right. And selling a new book for .50 day of release isn't going to affect Marvel in any way. They've got your money. They don't care. You've already plopped down that $3000. And to speak to what Thundercron said. I've NEVER found this site to be a good site to sell older books on. Especially not NICE CONDITION older books. Hell, I've always looked at what the majority of the stores here charge for newer books and wonder how they sell any of them. I mean, I get that there are a lot of places where you might not have access to a LCS, but I don't know why you wouldn't go to one of the sub services, get a nice 40% discount and not worry about it. I've always felt this that site was the equivalent to the .50 and $1.00 bins at shows. Lots of cheap, older stuff, and blow-out prices on newer overstock. And to speak to what Thundercron said. I've NEVER found this site to be a good site to sell older books on. Especially not NICE CONDITION older books. I have actually sold a number of Gold/Silver comics in nice condition here over the years. By "nice condition" I mean FN or above. Sure, maybe it takes longer for something to sell but the difference in fees between here and eBay is enormous. Which is why I will mark something up to sell it over there. Yeah, eBay fees are getting out of control. Maybe it's just that, if I had the money to spend on a "nice condition" book ... I wouldn't buy it online. I'd want to see the book in hand. Flip through the pages to make sure they're all there ... that there's no missing coupon that was overlooked, etc. Most people are honest, but I'd always worry about spending a few hundred on a VF Hulk 181, and finding the stamp cut out. How's the seller going to react. Deny the missing stamp? Claim I'm trying to switch out my copy for his? Or simply acknowledge the mistake and rectify the situation? You never know. I've managed to fill about 150-160 gaps this year in my Batman collection from here. And of all the books ive picked up, only a couple (like 3 or 4 at most) ive gotten that I said "that was absolutely misgraded... but.. when you're paying $4-$10 for the thing.. who cares? Buy comics to read I say (long as the pages and staples are solid im generally content) Only downside is ordering from so many different people is the shipping costs eventually add up.. cost of doing business though! Im still iffy on pulling the trigger on some of the higher priced ($100+) books people are selling. (that and im creeping towards the $15-$20+ gaps now for the remaining (newer :re late 70s/80s) which is somewhat of a pill to swallow but.. I am not one to ever haggle someone over prices. I'm a take it or leave it kind of person. Although to contradict myself.. I cant bring myself to pay "market rate" for Batman #570.. I hate that issue so much (art/quality) but because its Harley's 2nd appearance the price is.. meh. Just not worth it to me for such an ugly book imo... but.. that is personal opinion lol. [quote=monidaw1]I mean, I get that there are a lot of places where you might not have access to a LCS, but I don't know why you wouldn't go to one of the sub services, get a nice 40% discount and not worry about it. I've been doing this lately rather than buying my new issues on CCL. 35-50% off is what I get on most of the titles I collect. Occasionally, I'll get in late on a comic and pick up the back issues here or on eBay if nobody has it (or wait for a LCS to have a sale). One of the things I am most pleased with is how pristine the comics are when they arrive. I think some of the stores that I was getting my comics from on CCL before didn't store them in bags & backings, so spine stress marks were very common, despite the fact that they were all robo-graded as VF/NM. On the downside, there is no free shipping on the site that I buy from (but it is very inexpensive). Thus, I only have them ship once a month, so unless I want to pay extra for more frequent shipments, I have to wait to read any new releases (which doesn't really bug me, since I'm perpetually 2-3 months behind anyways). I can also see why somebody would prefer to shop here since you pay at the time of purchase and not 3+ months before you actually get your merchandise. For every comic you purchase from our 'Bargain Bin' (those priced $1 or less), another comic purchased over $1 will be $30% off (refunded via PayPal). eg. If you purchase 10 'Bargain Bin' books, then 10 books purchased that are each over $1 will recieve this refund, etc. Domestic orders of 25 or more comics qualify for FREE SHIPPING (Media Mail). Priority Mail orders of 25 or more comics receive a $5 refund (Foreign or Domestic orders). I've only done that once so far but the second time is about to happen by FOC with Return of Wolverine #1. I completely wish they'd just charge $1,000 minus the discount for the book and offer them individually but they make a lot more forcing the overpurchase up front. I just finished the math and it appears the Return of Wolverine is going to come out at about 26% with plenty of margin added. That's $1.04 for the standard cover, $260 for the 1000 qty copies. That had the shipping figured in ($150) also before coming to that. They also kicked in all the qualifier variant covers to count toward qty variants today. ALL RETURN OF WOLVERINE #1 MEET/EXCEED VARIANTS COUNT TOWARD RATIO VARIANTS ratio variants are what we call qty variants. The part that has me leaning that way isn't chasing the variants, it's that in doing so, one comic a month, the total retail price of all those comics (1,128 comics counting just the standard and qty variants alone) comes to $5,628.72 applied to the Marvel total for the month they base their discount tiers on over a 12 month average. Just doing that once a month with just one title automatically puts you in the 5th to 6th discount level once the averages kick in. Based on that I've been able to increase subscriber discount levels starting next month. I'm hoping it translates into increased traffic as more people stop by just to try out the stupid low price book of the month. If a few of them turn into subscribers or at least pick later issues up off the shelf that wouldn't be an undesired benefit but it all starts with issue #1. If you don't get it into people's hands how are they going to know they wouldn't mind #2? The whole thing might blow up in my face but I'd rather fail after having tried everything I can think of than giving up early with options still left on the table that could have been pursued. Most people don't realize I don't have a vehicle since Ellen left. I had the choice between using the new credit cards for a vehicle and an insurance payment or gambling on growing the business a bit. My brother lent me a bicycle so at least I can start popping down to the dollar store to hit the Redbox regularly while I wait to see if the new additions to the business pan out. In addition to adding a few new #1's with variants, I've also added in most of the "GALLERY" line of figures from Diamond and most every other superhero/horror/movie figure they offer for $45 or less and a couple high end lines like the One-12-Collectives and some of the numbered pieces like the Deadpool, Cable and Domino statue set as well as a huge increase in trades again to expand the sale racks in the other room. The Green Lantern Battery with Ring is in a box out front right now I'd love to open and look at but have to wait and hope the new owner wants to examine it before leaving. "start theme music by Willie as we fade into the night"
On the road again, just can't wait to get on the road again" Humm along, you know the rest!!! Is it me or has this thread gone off topic ? Thought it was for asking why one specific issue was going for a high price. Not saying that this isn't a valid discussion but seems better suited for its own thread. Welcome to the world of conversation. You start talking about something which leads to something else, and then something else but if you hang around long enough it tends to cross back over again before taking off in a new direction. 2-5 are all dirt cheap, so WTF?? I think it's amazing #6 even made it to the street. It FOC'd 6 days before 9-11 and had to be produced, printed and delivered to stores while New York and the DC Comics Headquarters were racked by the devastation around them. In New York City, approximately 430,000 jobs were lost and there were $2.8 billion in lost wages over the three months following the 9/11 attacks. The economic effects were mainly focused on the city's export economy sectors. The GDP for New York City was estimated to have declined by $30.3 billion over the last three months of 2001 and all of 2002. The Federal government provided $11.2 billion in immediate assistance to the Government of New York City in September 2001, and $10.5 billion in early 2002 for economic development and infrastructure needs. The 9/11 attacks also had great impact on small businesses in Lower Manhattan, located near the World Trade Center. Approximately 18,000 small businesses were destroyed or displaced after the attacks. The Small Business Administration provided loans as assistance, while Community Development Block Grants and Economic Injury Disaster Loans were other also used by the Federal Government to provide assistance to small business affected by the 9/11 attacks. It may not be the reason but I find it extremely interesting as a side note. I don't recall ever hearing about comics being delayed due to 9/11. Comics4Less has them listed right now for $5 & $3, respectively. It's the Bolland covers. 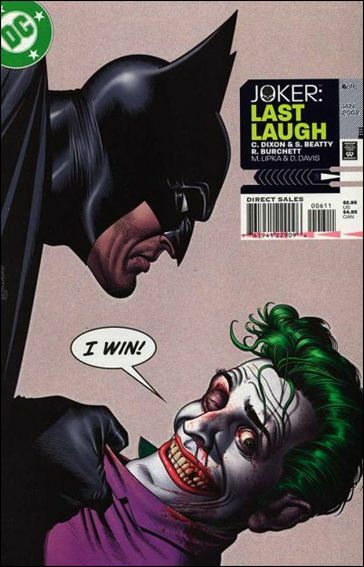 Specifically Bolland Joker covers. 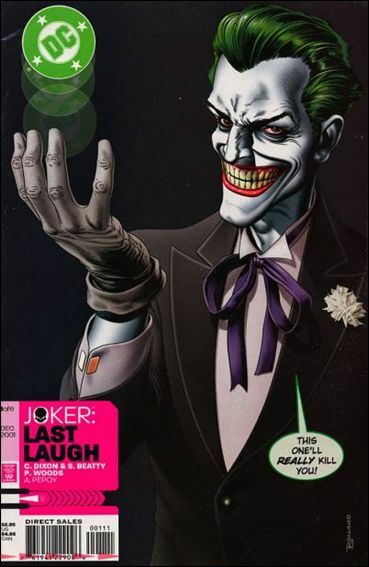 I actually remember reading an article back in the day (maybe Wizard) that used a phrase similar to "criminally rare Bolland Joker art". That's what I find amazing. How did they get through all the steps neccesary to get it from production to store with so many distractions, tragedies and hurdles in the way. A lot of TV shows and comics took noticable turns in story telling at that point. I couldn't imagine myself in that time frame wanting to pick up darker fare like I would expect most Joker story lines to head down. There had to be some affect on sales of the item with that many people out of jobs, loses in income and even total changes in life direction as a result. If sales were down any that would have had some increase in returns and cover strippings of unsold copies. I owned a pet store at the time and that 60 to 90 day period after 9-11 #6 would have been on sale in particular was brutal to get through with the slump in sales as people were unsure what was going to happen next and cut back on unneccesary luxury expenses like Pets and Comic Books. By December I'd decided to go work for parents Well Drilling just to make sure I could keep the utilities covered cutting the store hours back. After having read Detective Comics #850 today, I have to ask... Why is this issue worth so much, but not in the reason it's so valuable, but why do people actually buy into the reason that this is valuable. Why do people buy that this is the "first" appearance of the Gotham City Sirens? Was someone just sitting on a bunch of copies when it was at best cover price and said, "Hey, Poison Ivy and Harley Quinn appear on one panel each on the 2nd to last page stealing money from Hush based on information from Oracle given through Catwoman. I bet if I said this was the first appearance of the Gotham City Sirens, I could flip these copies for a ton of money!" And then people actually believed him. In the old days, I don't think would have even counted as a cameo. I don't know if this is in the same vein, but I've been looking at issues from Avengers: The Crossing. I fully expected to be able to piece the storyline together from dollar bins, but then when I seriously started looking for issues, I realized it wasn't going to be that easy. I mean, it doesn't seem like anyone on the internet actually likes the story, plus the omnibus can be had for about $40 at worst. The funny part is that issues that regularly show up in the dollar or cheaper bins are the shiny overpriced bookend special issues. These issues came out when Marvel readership was quickly shrinking, and print runs were dropping. They don't go for a ton of money, but they are hard to track down individually. Batman Chronicles Gallery - a book full of pinups. Cover price in the late 90s was $3.50. Every copy here at CCL is in the double digits. I finally saw some scans from the issue, and I didn't see anything out of the ordinary until the last page. Is the going rate really due to the Harley and Ivy page by Bruce Timm? First "appearance" in an in-continuity/not-Adventures book? E-Bay sales ads claiming it's the second appearence of DCU Harley Quinn. Prices up close to $100 for book-in-a-box listings. Double digits at mycomicshop as well.